1 x 18 Volt BDCH188N Hammer Drill offers the power and speed to drill into masonry, steel and wood. With 11 torque settings screwdriving into a variety of materials with different screw sizes. It's variable speed settings provide fingertip control for all drilling and screwdriving applications. Max Torque: 28Nm, 11 Settings. 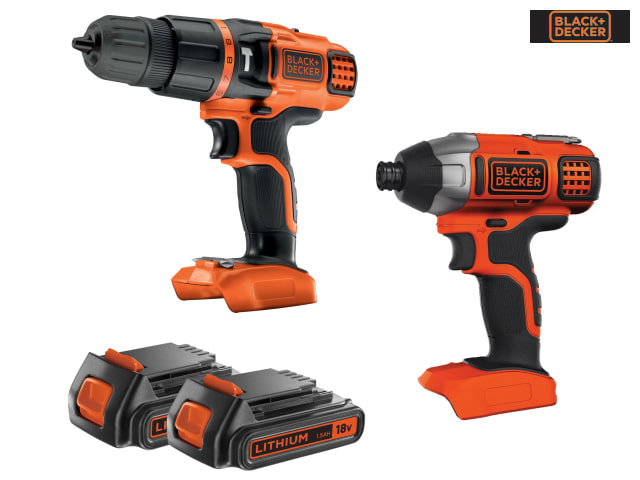 1 x 18 Volt BDCIM18N Impact Driver has a durable metal gear casing and delivers up to 155Nm of Torque for effortless driving and removal of screws and bolts. The driver has a compact, lightweight design that makes the drill easy to use over long periods of time. It's anti slip soft grip provides additional comfort. Spring loaded slide system is durable and prevents dust ingress. 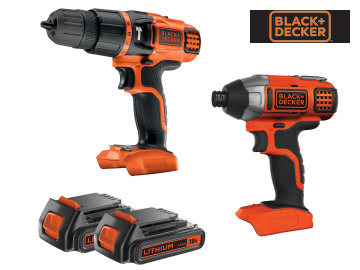 Also comes with: 2 x 18 Volt BL1518 1.5Ah Li-ion Batteries, 1 x Charger and 1 x Tool Bag.